Also, my nominations for worst movies of the year are Sucker Punch and Green Lantern. The former because I thought it had potential and it was pure torture; and the latter because it’s just a colossal mess and that superhero deserves better. Check out my 2011 Movie Reviews for ratings and/or reviews of everything else. Note: Laurence Bowers out for season. 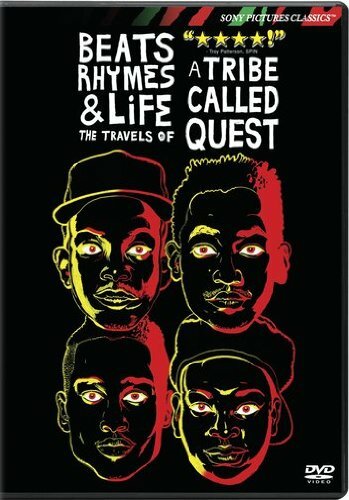 Quick Thoughts: This documentary serves as an homage to the legendary hip-hop group A Tribe Called Quest. Director Michael Rapaport spends the duration of the film telling the personal stories of the group and then tensions that broke them apart with the voice of a long time fan hoping to reunite one of his favorite rap ensembles. Whether or not you’re a fan of the musical genre should matter little; while this film is certainly a testament to Tribe’s accomplishments, it’s ultimately a story about friendship and how instant fame and success can hinder the relationships of people. Beats, Rhymes, & Life is the perfect hip-hop film, highlighting one of rap’s best all-time groups and rekindling my own love for their music, while telling a story of how two best friends can become silent enemies due to creative differences. Replay Value: A must own for any credible hip-hop fan worthy of multiple viewings. Recommendation: One of my favorite films of the year and a no-brainer for hip-hop junkies. *Nothing changes in the Top 8. North Carolina is ranked significantly lower than they are in the national polls. While I still think they are a top 3 team in the nation, it’s hard to argue they have better resumes than the teams I have ranked ahead of them. Most of the top teams coasted this past week, but Louisville posted a strong win against Memphis and Baylor got taken to the buzzer by BYU. *Xavier took its first loss of the season… to Oral Roberts. However, they only drop one spot because Tu Holloway and Mark Lyons–their two best players–were both suspended for the game. *Missouri jumps a spot due to the Xavier loss. I’d consider holding Xavier at #9, but Mizzou has just been MASHING every team they play. *I’ve kept UNLV in my top 25 ever since they knocked off North Carolina, but the national polls made a rash move in dropping them out after losses to Wichita State and Wisconsin, both tough teams. After handing Illinois their first loss of the season, however, the Running Rebels should make a return to the national polls tomorrow. *After being one of the few publications to rank Michigan State in the preseason, I was happy to see them crack the top 25 last week. They are currently on a 9-game winning streak that includes wins over Florida State and Gonzaga, two teams that were ranked in the preseason. The Spartans only losses were against Duke and North Carolina, both top 8 teams. *Much like UNLV several weeks ago, there’s no reason to push the eject button on Illinois just because they lost a game. They still deserve a spot in the top 25 for now… but Big Ten play should prove this is a team that eventually doesn’t belong. *How many weeks have I had San Diego State in my top 25? Is this the week the rest of the nation finally catches on? With Alabama, Texas A&M, and Vanderbilt all likely dropping out of the AP Poll, I think so. *Speaking of Alabama, what is going on with the Crimson Tide? The first several weeks of the season, they emerged as one of the stronger and more surprising teams in the nation. Now they’ve dropped three of four… to unranked teams. WTF? *With 8 undefeated teams left in the nation, does anyone want to place bets on which team will last the longest without a loss? Put your money on Murray State. At 12-0 and with wins over Dayton and Memphis, I finally bite the bullet and rank them. They’ve managed to make it through non-conference play unscathed and have a better chance than anyone to enter the NCAA tournament undefeated. *I put Texas A&M back in my top 25 last week solely on the strength of star Khris Middleton returning to the line-up. The Aggies rewarded my faith by promptly getting smashed by Florida. See ya. *Creighton returns to my top 25 although they have only one notable win on their resume (vs. San Diego State). Doug McDermott is just too damn good though (24.1 ppg, 8.8 rpg). I’m insanely tired and I have a long work day ahead of me tomorrow. I will clean this up and add commentary when I can, but this is my top 25 through today’s action. Comments: Consider this a brief stay at the top. While Syracuse is clearly benefiting from recent losses for Kentucky and Ohio State, they have at least emerged as a legitimate national title contender. Comments: Good to see the national polls feel the same way I do: losing on the road to a good Kansas team without Jared Sullinger on the floor is a loss that comes with an asterisk. Comments: Take away the blowout loss to Ohio State and Duke might have the most impressive resume in the nation. Comments: Growing pains: that’s what we call the loss at Indiana. Comments: Went against my conventional routine and dropped Louisville one spot even though they haven’t lost a game all season. Anyone care to argue that any of the teams ranked above them haven’t been more impressive? Comments: I have UNC lower than the national polls because they have two losses and struggled against Long Beach State this weekend. I still think this is one of the nation’s top 3 teams, but they haven’t played that way so far. Comments: Hopefully the suspensions that resulted from the brawl with Cincinnati don’t cause this team to lose a game. The Musketeers have looked tough as nails so far. Comments: Even without Jared Sullinger playing, the win against Ohio State is still impressive. Comments: Okay, the Hoosiers are for real. This team was undefeated before toppling #1 Kentucky and hyped freshman Cody Zeller has exceeded expectations. Comments: I really liked Alabama the first couple weeks of the season, but they’ve been scuffling recently. Comments: I might be a week late with this ranking. You are currently browsing the The Bat Cave blog archives for December, 2011.